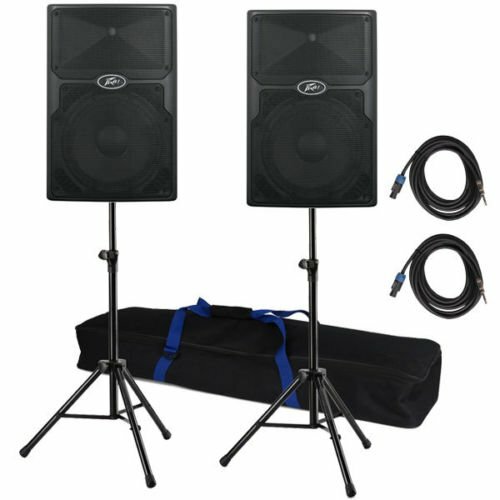 Peavey PVx 12 2-Way PA Speaker Peavey PVx 12 2-Way PA Speaker delivers superior sound quality by utilizing advance materials. It has a molded ABS exterior making it lightweight yet rugged for live music or speech application. The PVx 12 will handle 400 watts program and 800 watts peak. This enclosure utilizes a heavy-duty 12 inch woofer with a 2 3/8 inch voice coil, and a RX 14 1.4 inch titanium diaphragm compression driver coupled to a constant directivity horn. Connections are made via two 1/4 inch phone jack connected in parallel to accommodate daisy-chaining. Peavey has designed this 2-way speaker to be used a variety of ways: on the floor, pole mounted or flown via top and bottom flying inserts. The Peavey PVx 12 2-Way PA Speaker comes with a durable injection molded enclosure that features a black powder-coated steel grille that provides driver protection and a professional appearance. If you have any questions about this product by Peavey Inc, contact us by completing and submitting the form below. If you are looking for a specif part number, please include it with your message.